2018 could be the turning point of your life and career. You could decide to start a blog as a side hustle or (if you’re financially secure) take it up as a full time venture. Either way, if you start and run your blog like a pro, you could see amazing results in your life and career. Making money from blogging is simply one side of the coin, the other side is about contributing to the human community and helping people live better by giving them the knowledge they need. If you can dedicate your life to improving others’, I don’t see any reason why you shouldn’t, especially considering the fact that 2018 is just the year to do it right. The tools and technologies out there could never be any more complete and affordable. And never could people start blogging like a pro even with no technical knowledge of designing, coding, and marketing, easier than in 2018. So I say forget all the fears and doubts about starting a blog. I say neglect all the naysayers who are too afraid to scale up to the competition. 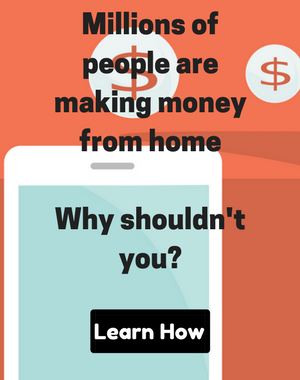 Two years from now, you could be the go-to authority in your niche and you could make a full living from the comfort of your home. All you need to do is learn how to blog like a pro. Forget trial and error and start learning true and tested techniques to beat your competitors and conquer your niche. You need a plan to tell you what to do exactly and how to grow your blog like a pro step by step. Here’s where a comprehensive source of true and tested knowledge could be priceless, and you’re just about to read one. From choosing a profitable blogging niche (the most important step for starting a blog) to increasing your traffic and making money, we’ve got you covered. Read this post religiously, and implement the techniques and tools included in it to see amazing results like the people before you did. Although many people argue that you should choose your blogging niche based on your interests and experiences, I personally think that choosing a niche is way more complicated than that. Don’t get me wrong, it’s a great idea to consider your interests and experiences when choosing a niche, but there are more important factors to consider along side interests and experiences. In fact some of my fellow bloggers are running profitable blogs in the niches they did not know much about in the first place. Professional bloggers see blogging more than writing about their interests — they consider the audience they’re trying to reach and the money making potential of their traffic. Do you think your niche is appealing to enough people, or just a small group of people would find it interesting? Where do you think you can find your visitors? Are they active on social media, which network? Forums? Search engines? Some popular websites? What are some demographic and behavioral characteristics of your audience? Are they mainly men, or women? Which generation do they belong to (baby boomers, generation X, Millennials, Generation Z)? What are their buying habits? etc. Getting to know your audience helps you produce and promote content that is appealing to them. The topics to cover, your writing style, your promotion methods, and how you should monetize your blog all depend on what’s interesting for your audience. If you’re thinking about blogging as a source of income, then you should also do some research on the money-making potential of your niche. How do you think you can make money with your website? Are there any products you can sell or help others sell (affiliate marketing)? Can you launch your own ebooks or ecourses? Do you think you can establish yourself as an authority in your niche and sell various services (like consulting) related to it? Even if you want to rely on ad networks to monetize your blog, you need a lot of traffic in order to have a good income. So before you make any decision on your niche, you really need to spend some time to make sure there’s enough money potentials in it. First of all, you can’t choose a niche that is too technical for you to write about. If you want to hire somebody to produce content for you, it’s fine, but otherwise it’s a total waste of time. For example, you can’t just start a blog about mechanical engineering if it’s too technical for you. Generally, there should be some hope for you to learn about the niche you’re going to choose. However, if you don’t know anything about the topic yet, it’s fine, you can learn. There are thousands of books, videos, blogs , etc. out there that can help you learn you niche. Even if you can’t produce content yourself, you can hire a blogger or ghostwriter to do it for you. There are lots of freelance bloggers and content marketers you can take advantage of in any niche. So, if you know that spending money on crafting an ebook or a series of tutorials could make you a lot of money, you can assign it to other writers. But generally, while I’m not insisting on focusing on your interests and experiences for choosing a niche, I think your niche should not be out of reach for you. 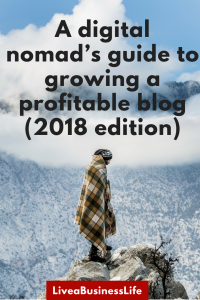 There are some ways to find out blogging niche ideas, but doing research on these ideas to find out whether they are profitable enough is more important. For some niches, there’s no other monetization way than ad networks while for others there are thousands of products to help sell and earn commissions as an affiliate. So, if you came up with a niche idea, make sure you check out current blogs in that niche to find out what monetization strategies they use. Maybe the easiest way to come up with a blogging niche is using the knowledge you already have. Most experts recommend doing this in order to have a better view of what you’re going to do, but it doesn’t mean that you should stick to what you know for good. In most cases, you need to step outside the realm of your knowledge and learn more and more during the researching process. 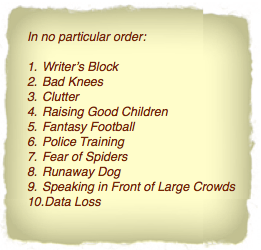 This is a list Pat Flynn came up with. Then, all you need to do is do some keyword research and find out some keywords in these niches that are frequently searched for and the same time are not that competitive. 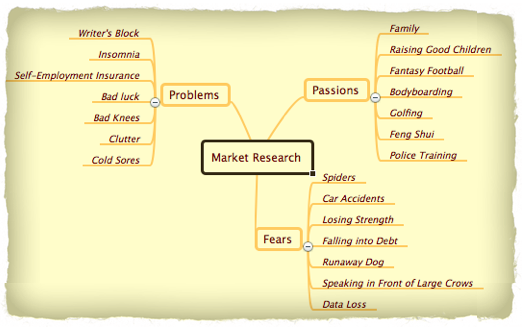 Pat does this using a keyword research tool called “Marketsamurai”. The next step is choosing a domain name that contains the exact keyword and starting your blog. 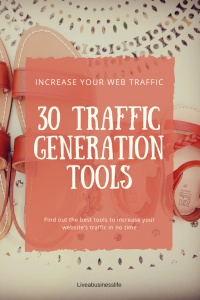 Pat’s reason for doing this is that by narrowing down your niche and targeting some keywords, you have a better chance for increasing your rankings and get some organic traffic. You can actually read about the exact process he went through to choose a niche for a blog, here. 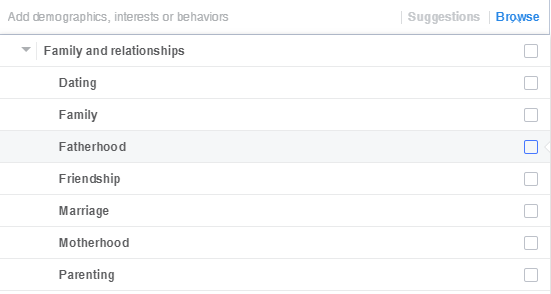 Fellows at Facebook have done a great job in categorizing their users’ demographic and behavioral characteristics. And they’re providing this information to Facebook advertisers for free. 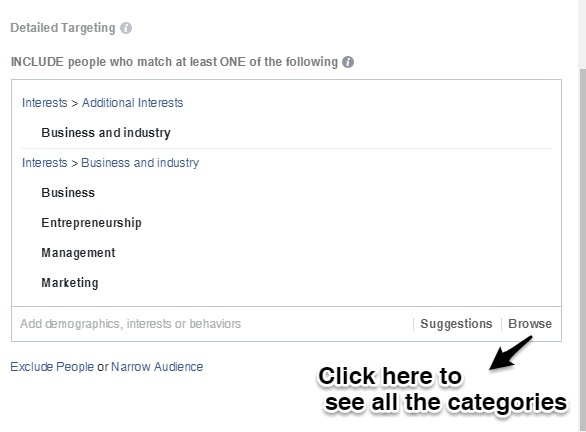 If you’ve ever done Facebook advertising, you’ve noticed that you need to determine the audience you’re willing to target before running your ads. For example, when clicking on “Boost post” option in your page, you’ll see the audience section on the left-hand side of the screen. Click on “Create new audience” to see a screen like this. Then click on “Browse” to see all the categories. From there you can see the main categories to choose from. You can choose to see the subcategories of “Demographics”, “Interests”, and “Behaviors”. If you dig a little deeper in all of these categories, especially the behaviors category, you’ll see quite a lot of detailed useful subcategories to consider as a choice for your blogging niche. Each of these subcategories have a large audience and you can be sure that people are interested to know about them. When you’re choosing a blogging niche, it’s almost impossible to come up with a first-of-the-kind niche. In other words, you can’t expect to start a blog and have no competitor. In fact, one of the greatest ways to come up with a blogging niche is looking at successful examples. And analyze its monetization strategy by checking out whether you find affiliate links in their content, the products they sell, or whether they’re running any ads. Probably by using the same strategies you can have a successful blog too, so you might want to consider taking the same niche as them. I’m not saying that you should have the exact same content as them (although you can do that and see some results as most of the content on the internet is rehashed), but doing a good competitive analysis on successful examples could put the guesswork out of your way. You shouldn’t be afraid of competition in choosing a blogging niche because first of all, internet users are more than you could imagine and no blog could ever target all of them. So there’s always enough audience left for you to target. Second of all, success in today’s market is all about gaining competitive advantage. It’s all about providing a solution for an issue that was not addressed before. So if you can cast a different look, provide more detailed content and in-depth insights, and promote your content better than others, you could have a competitive advantage even in the most crowded niches. And again, if blogging is more than a hobby for you and you want to make a living with it, you need to pick a niche that is both popular and craved for, and money making. So before you start a blog solely based on your interests and experiences, take time to research the popularity and the money making potentials of your niche. If you’ve come up with a profitable niche idea, you’ve basically done the most important part of the work. The next step is setting up your domain and hosting — this is the easiest phase in starting a profitable niche blog. A domain name is the name of your website. For example, the domain name of our website is “LiveaBusinessLife.com”. It’s best to spend some time considering other popular domain names in your niche, but generally you don’t need to be so picky. The perfect choice is a .com domain as it is the first choice that comes to people’s minds. Choose a domain name that’s easy to remember. Avoid long domains, made-up words, and any special characters. It’s great to choose your own name as your domain if you’re willing to establish your personal brand in a niche. Don’t overthink your domain name. There are many popular blogs with seemingly ridiculous domain names. Plus you can change your domain name anytime. After you came up with a good domain name, you need to register it with a domain registrar like Namecheap or Godaddy. 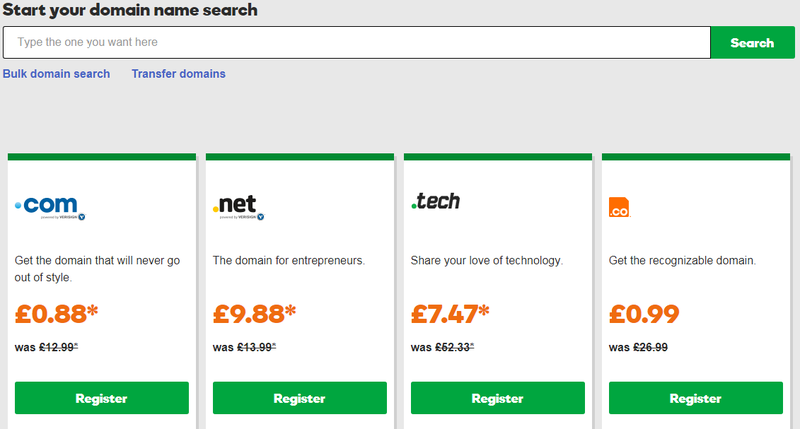 With Godaddy you could register your domain for one year for only $0.88 provided that you register for two years. So basically by paying $12.99 (price for one year) + $0.88 you can have your domain name registered for two years — amazing deal! Moreover, Godaddy is a go-to company for registering domain names and they are experts in this. You could also register a domain name with your hosting provider. Many of hosting provider companies such as iPage even include a free domain with some of their plans. Domain registrars are reliable professional ICANN-accredited service providers and provide premium support and higher security. If you decided to move your site to another hosting provider, you don’t need to transfer your domain. You simply need to update your name servers. Domain registrars could give you more LTD options (such as .online, .mobi, .internet, .sales, etc.). If you have multiple domains, you can easily manage them from one dashboard. So it is recommended that you register a domain with a registrar and then move on to buy a hosting. After you chose and registered your domain name, you need to think of a storage space to upload your site and all its content. This storage space is called a host. There are many hosting providers for different budgets and needs, but the general rule is high quality premium hosting services are more costly. You’ll experience lots of down time. This means that your site will be out of reach frequently. 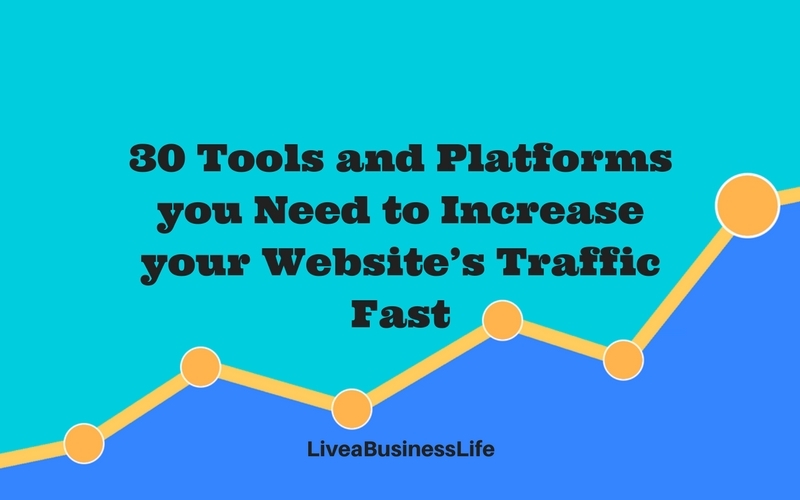 Your site will be slow and you’ll lose your visitors as a result. You won’t get a good technical support. This is a major factor for deciding a hosting provider. 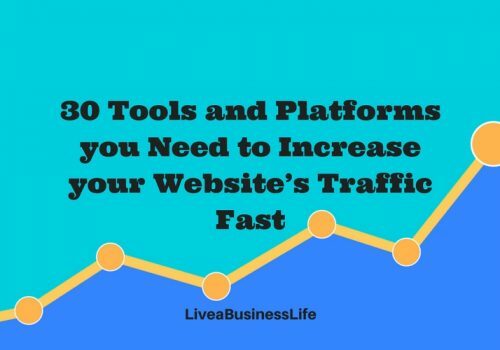 You’ll experience crashes whenever there’s a spike in your site’s traffic. You’ll see limits due to outdated software. This is why experts recommend using a premium hosting even for a beginner website. To save your time and energy, I’d recommend using A2hosting as one of the trusted premium hosting providers. No problems with technical issues — you’ll have access to a dedicated support team. You can check out their full features for shared hosting on this page. Buying a service from them is not a difficult task. Just visit the above page and choose a plan based on your budget and needs. 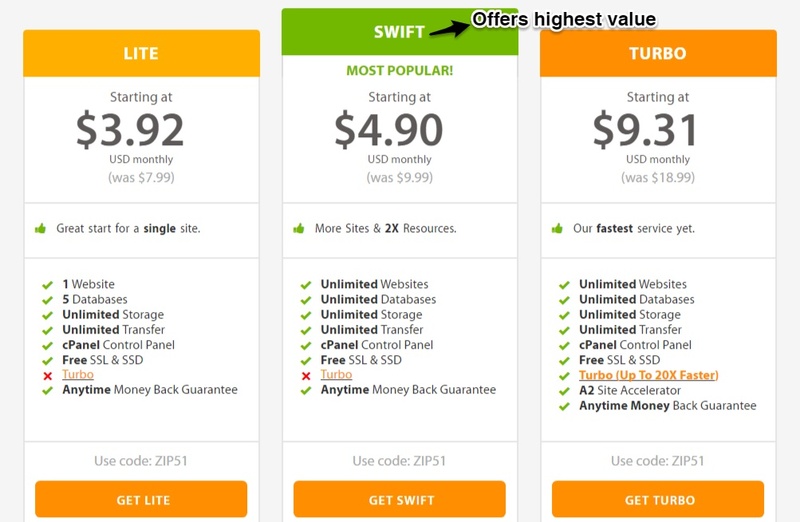 It is recommended to choose the “Swift” plan as it offers the most value in a reasonable price. After you chose a plan, you’ll be directed to “Choose a domain” page. If you have registered your domain name with a registrar, choose “I will use my existing domain and update my name servers” and enter your domain name to continue. Otherwise, you need to purchase a domain with them. In the check out page, remember to purchase a plan for at least two years in order to get a discount other than the one you get on your first purchase. Also note that the discounts offered to you are applicable only to your first purchase, and the renewal cost is not discounted. So you’d better buy a service for two years or more otherwise you’ll have to pay the full price after one year. The next thing you need to remember is choosing “wordpress a2-optimized” to be auto-installed with your service, otherwise you’ll have to install wordpress manually after your purchase (which is a simple process). If you choose this option, you will also need to take note of the username and password provided for you in order to login to your wordpress site. You don’t need any more features such as dedicated ip, turboboost, priority support, et., so skip them. It normally takes 24 hours until the changes take full effect. Here you need to use the username and password from the checkout page. Remember, if you have not chosen to auto-install A2-optimized wordpress, you won’t be able to log into your account. In this situation, you need to login to your A2-hosting customer portal first. 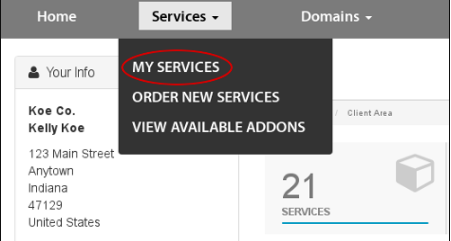 Then click on “My services”. 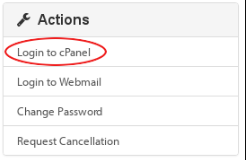 After you entered the cPanel area, you’ll need to find the Softaculous app installer and choose wordpress to be installed from its apps. Then from “Choose protocol” select “http://www.” In the Site Name text box, type the site name. By default, the site name appears in the title bar of users’ web browsers when they visit your site. In the Site Description text box, type the site description. By default, the site description also appears in the title bar of users’ web browsers when they visit your site. Remember to change the admin username and password. Also if you want to set auto-updates for your plugins and themes, you can check the boxes in the “Advanced options”. Accept default for the other options. Your wordpress website is ready to use. Go to yourdomainname.com/wp-admin and type in your username and password. 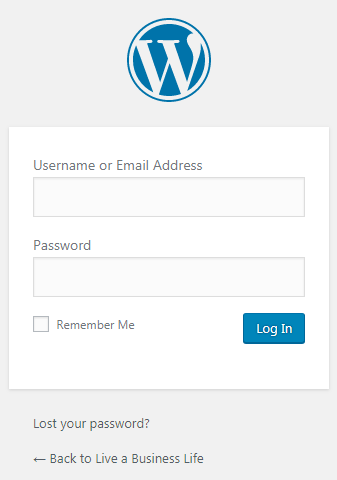 Now that you have your wordpress site running, login to your account to customize it. 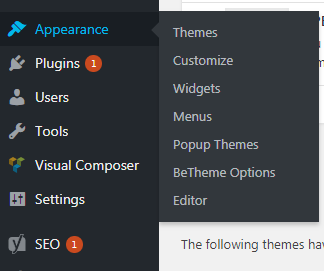 In order to install a theme on your website, go to “Appearance” then “Themes”. You can choose a theme from the available ones on wordpress. You can start your blog with a free theme and that’s basically no problem (check out this great list of free wordpress themes), but for a more professional look, you need to purchase a premium theme. the biggest theme ever, betheme contains +290 pre-built websites that could be imported with just one click. With Betheme, you’ll have full control over anything with no coding knowledge. From advanced header/sidebar/footer design to amazing in-post shortcodes, you can rely on the capabilities of Betheme to add more and more features to your blog. You can also make beautiful pages with the drag-and-drop visual composer, and eye-catching sliders with Slider revolution and Layerslider that are included for free in each licence, so basically, there is nothing you can’t make with this theme. Divi is famous for its visual builder. You can literally customize anything you see on a page through a backend visual builder, so don’t worry if you don’t know anything about coding and stuff. Elegantthemes’s purchase plans are also amazing. For a yearly price of $89 or a one time price of $249, you can have access to all of their premium themes and plugins for unlimited websites. So there’s no reason not to join their community. 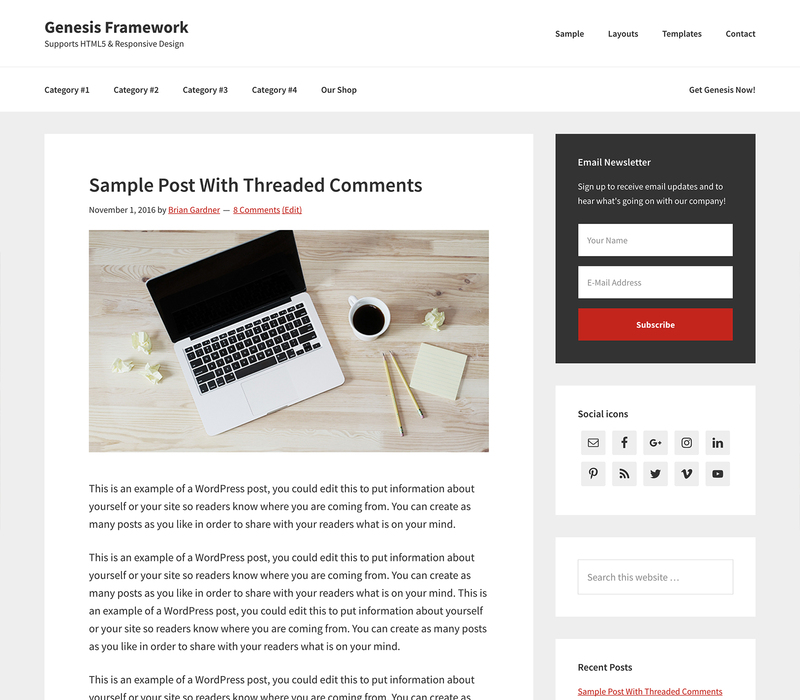 Genesis framework is a flexible theme by Studiopress. Using this framework is a little difficult if you’re not well familiar with CSS and PHP. This means that you need to spend a lot of time tweaking the code lines to make a website you like. This said, Genesis is one of the most powerful, secure, and reliable frameworks out there. You can also take advantage of some premium plugins they offer and build your website. WordPress allows you to use some plugins to increase its functionality. Some of these plugins are simply expensive and unnecessary while others are essential for your growth. In order to install a plugin that’s already listed in wordpress’s plugins list, you need to go to “Plugins” then “Add new” then search your plugin’s name. Wordfence security: Wordfence is a must-have security plugin. Yoast SEO: Yoast SEO is wordpress’s most popular SEO plugin. It takes care of technical SEO issues and allows you to do more on-site SEO configurations. W3 total cache: W3 total cache improves the performance of your website. You could go with their default settings and see an amazing improvement to your website speed. Ninja Forms: With Ninja forms you can easily make different kinds of forms and insert them in different places of your site. AddToAny share buttons: AddToAny adds social media sharing buttons to your site. Askimet: Askimet is essential for preventing spammers from entering your comments and contact form submissions. Smush: Smush automatically compressed and optimizes your images. Updraftplus: You need Updraftplus to take backups from your website. WPBakery Page Builder: WPBakery Page Builder is a premium plugin that allows you to build amazing pages visually. Sumo: Sumo allows you to grow your email list by providing pop-ups, forms, triggers, etc. Thirsty Affiliates: Thirsty Affiliates allows you to cloak your affiliate links in its free version and offers amazing premium affiliate marketing services such as automatically placing affiliate links in your text. As a blogger, the greatest way to grow your audience and increase traffic to your blog is producing and promoting content that grabs your readers’ attention. So the first thing you need to do is producing blog posts regularly. Start with the most basic information your readers need and build your way to more advanced topics. You’ll research and learn along the way. In the “Add new post” page, you need to assign a topic to your post, edit the permalink, add your content, tags, categories, and a featured image, and you’re good to publish your blog post. This is an easy process and you’ll get hold of it in no time, so don’t worry. While doing your research, keep in mind these tips for avoiding plagiarism. While writing your post, make sure you optimize your content for more exposure through search engines. I have an ebook on top SEO techniques and tools, check it out. Also, remember to read my post on how to use long-tail keywords for more traffic. It’s a great source of traffic. You can send out your latest updates to your email list and get people on your site for free. It is a great source of potential buyers. They have subscribed to your list because they’re interested in your content or services, and they are more likely to buy from you. In fact, according to Direct Marketing Association, email marketing on average sees a 4300 percent return on investment (ROI) for businesses in USA. This beats any other marketing channel. 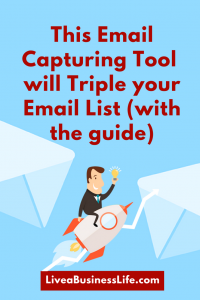 There are some trues and tested techniques to grow your email list. Read my comprehensive blog post on 10 Power Hacks to Grow your Email List in No Time. Maybe the most pleasurable part of blogging is making some extra (or serious) cash from your blog. Once you got your blog set up and published some posts, you can start monetizing it. Remember, making money from blogging depends a huge deal on the level of trust you make with your readers, so unless you’re already an established authority, it takes time to make money from blogging. Selling your own ebooks/ecourses: If you know enough about your topic, it’s a great idea to launch your ebooks or ecourses to make money. Almost all professional bloggers have an ebook for sale on their website and they’re making decent money with it. Ecourses have also grown very popular. They’re much cheaper than physical courses and people love their interactive content. Affiliate marketing: If you don’t have a product of your own, you can help others sell their products and get your commission. Affiliate marketing is very popular these days especially because almost all Saas companies have an affiliate program. Amazon, Ebay, Walmart, and other ecommerce giants offer affiliate programs as well — you need to apply, be approved, and then start selling their products to earn a commission. Ads and sponsored posts: If you have a good traffic to your blog, you can display some ads or sponsored posts to make money. Ad networks such as Google Adsense could be a great choice. You can also accept sponsored posts and receive money upfront, but you need to be an influencer in your niche first. Freelancing: One of the greatest merits of having your own blog is the possibility of showcasing your expertise. If you’re interested in writing, editing, designing, programming, etc. you can find good paying clients from among your blog’s audience. 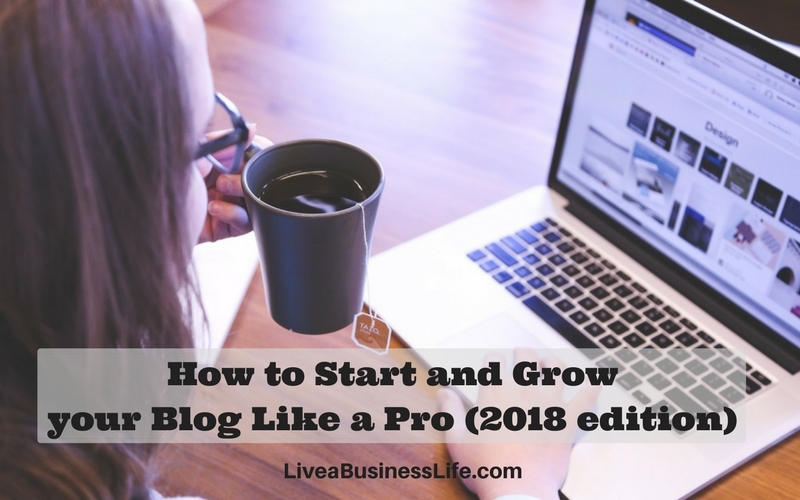 Yes, you now literally know how to start and run your blog like a pro. You just need to roll your sleeves up and implement these techniques. Remember blogging like a pro is not a get-rich-quick scheme, you need to spend time and money in order to see real results. So be patient, publish regularly, grow your email list, and educate your readers. As time goes by and your blog gets bigger, you’ll need to take advantage of an agile project management tool to facilitate complicated and time-consuming projects. Blogging has always been such an amazing outlet for me. Plus I make money with it. It’s not much but it’s okay. Thanks for sharing this. Way to go Joe, congrats on your blog and your income!